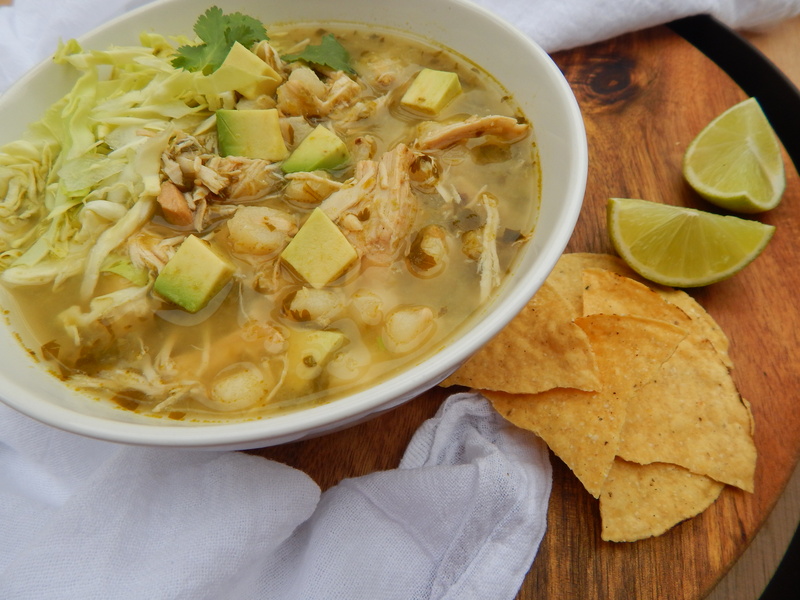 Chicken breast and hominy simmer in a spicy broth made of tomatillos, onion, garlic, cilantro, peppers and a few other ingredients that makes it taste like you slaved away all day. 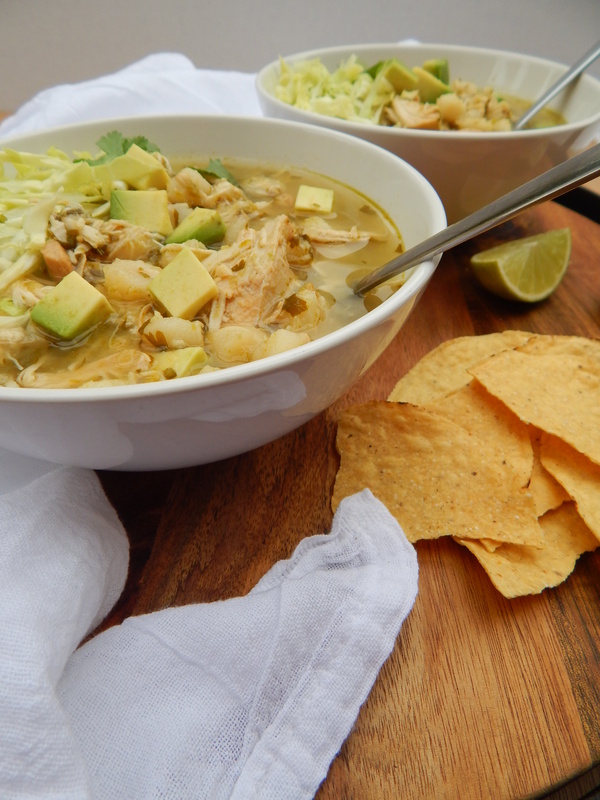 There is nothing like a bowl of hot pozole to warm you up on a chilly day. Serve with a fresh squeeze of lime and crunchy tostadas on the side. 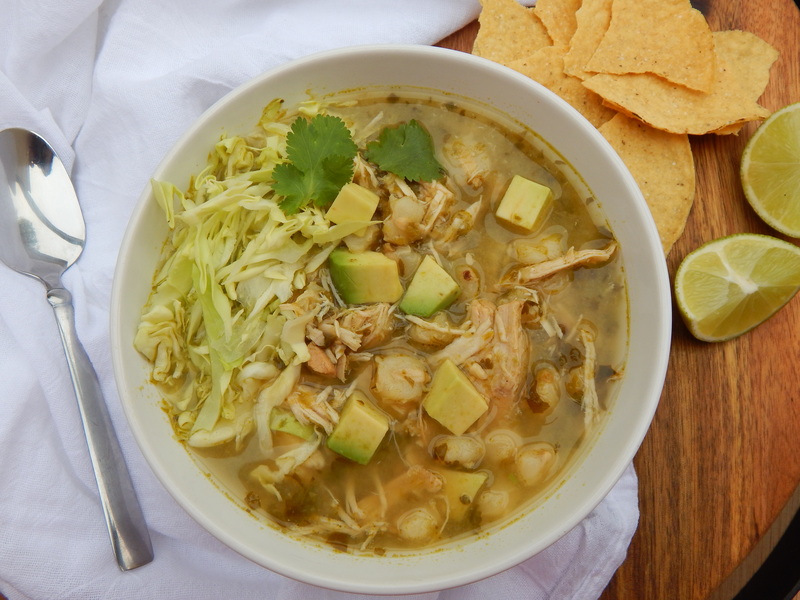 This slow cooker chicken pozole verde is the perfect dish to put together in the morning. It’s fast, and will be ready when you get home from work or after any busy day. Bust out your slow cooker and let it do all the work for you. The recipe made the right amount for my husband and I to finish in two days. 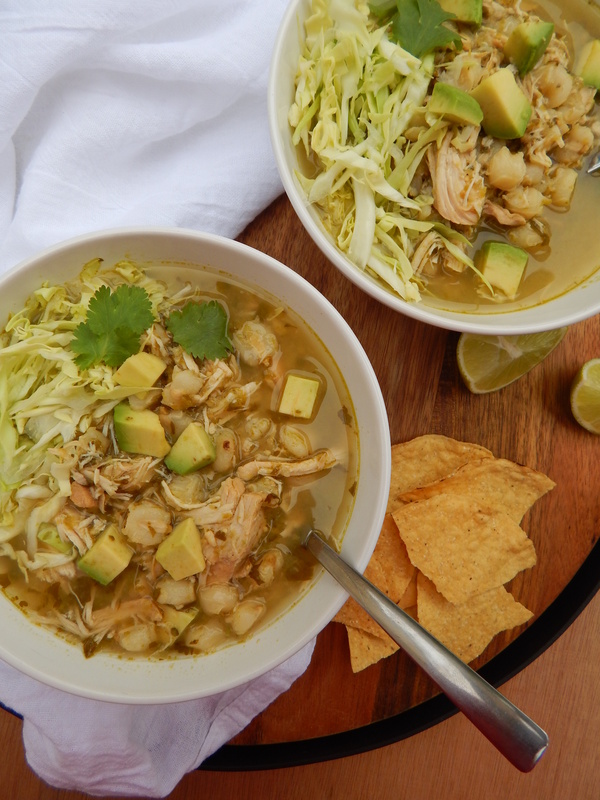 Did I mention we love pozole? You can also make this for yourself if you are only cooking for one. It’s also. great soup to freeze if you don’t need it all right away. I had a really busy week at work. I literally made this one weeknight at 12:00am. It was ready in the morning, and my husband and I ate it for breakfast, he ate more for lunch… and we had it again for a late breakfast the next day! 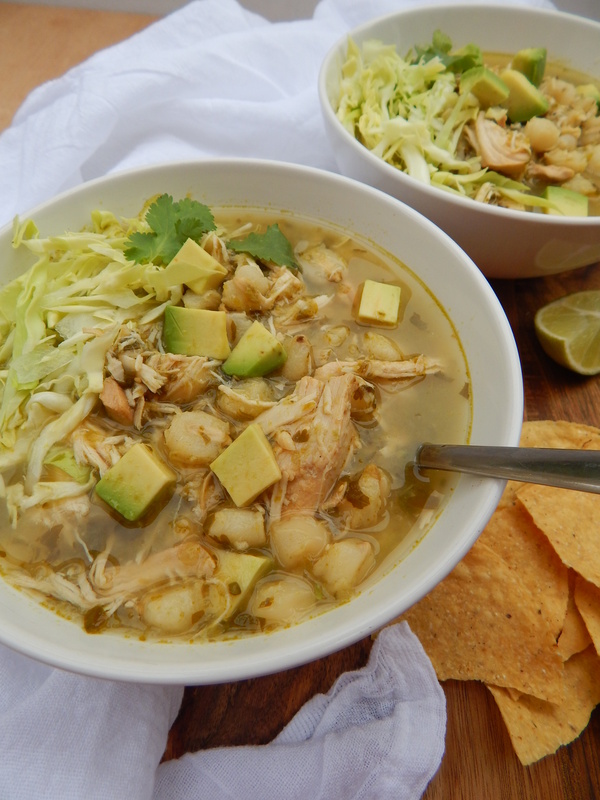 Make this slow cooker pozole, and share a bowl with your family. You can tone down the level of spiciness by following the notes on the bottom of my recipe if you are cooking for kids or don’t like very spicy food. Shredded green cabbage, lime wedges, diced avocado, chopped cilantro and onion, tostadas. 1. To make the salsa verde that goes in the pozole add tomatillos, jalapenos, poblano pepper and ¼ teaspoon salt into a medium pot. Cover with water and bring to a boil over medium high heat. Once it boils, reduce heat to medium and gently simmer for 5-8 minutes. Remove tomatillos and peppers from the pot and add to blender. Do not add any of the cooking water. Let it cool for 5 minutes. Next add in chopped onion, oil, garlic, cilantro, ½ teaspoon sea salt and blend until mostly smooth. 2. 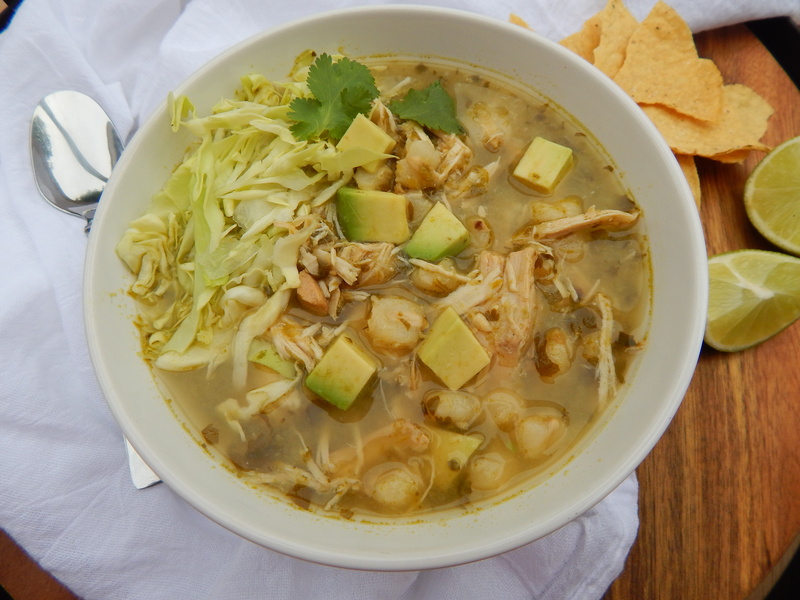 In your slow cooker add in all remaining ingredients: chicken, chicken stock, water, bay leaf, garlic cloves, whole onion, drained hominy, 1 tablespoon sea salt, black pepper, cumin and all of the salsa verde. Stir all ingredients together and cook on low for 6-8 hours. 3. Once the pozole is cooked remove the bay leaf, whole onion and whole garlic cloves and discard them. Taste for seasoning and adjust as desired. Remove the chicken breasts from the slow cooker and shred with a fork then return back to the pot. Stir pozole together and serve hot. • If your tomatillos are very small use 10-12 instead. • Use whole jalapenos, and do not cut open to remove seeds. If you want a less spicy soup use only 1 jalapeno. If you want almost no heat at all then use one jalapeno with seeds removed. • I used Swanson Chicken Stock. Chicken broth has less flavor than chicken stock so keep that in mind if you use broth. You can use homemade chicken stock if you have that on hand as well. • Serve with tostadas. I like to break up my tostadas and add the pieces into my pozole! Looks like a wonderful soup – great comfort food! Thank you so much! I hope you enjoy it… Can’t wait for cooler weather to make this more and more! Thank you so much for the recipe. I always wanted to make this, but never knew how. I made it last week just to try it out and everyone enjoyed. I am actually making it again so my parents can taste it. Thank you so much for making it so easy. Love that I can throw everything in the crockpot, forget about it, and make a delicious meal. Thanks for sharing. I’ve never tried this before! It looks so tasty, and I love that it is a nice easy supper to make. Can I use store bought salsa verde instead? How much would I need for this recipe? Hi! Love this recipe but have a question. When making the salsa verde, let the water cool and then is any added to the blender? Thanks! The hominy doesn’t come out too cooked/mushy from cooking so long? I am attempting this recipe tonight to have ready in the morning 🙂 I have attempted red pork pozole in the crockpot and added the hominy on high for 2 hours close to the end of the cooking cycle. So just wondering how hominy cooked for 6-8 hours hold up! Hi, I’m doing your receipt for the first time! Unfortunately it didn’t fit in my crockpot but I do have a roaster oven. My only problem is what temp should I put it on?? 150-450 degrees F.
Hi Iliana… Thank you for making it! I hope you enjoyed it! Could I make this recipe on the stove? Hi Ruby, sorry I never saw this comment until now. Im sure you could, but I haven’t tried the measurements for that. When do you add the salsa verde? In the crockpot at the beginning or at the end? Thanks! !